LUXERI produces special multimode fiber bundles. 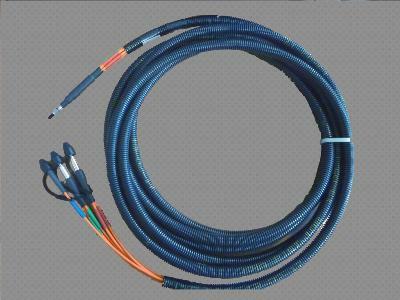 These bundles are mounted in different types of sheaths (PVC, PE, LSZH, steel, PVC metal) in diameters corresponding to the diameter of the selected fiber and the number of fibers. LUXERI provides a wide range of special multimode fibers thanks to a choice of low OH and high OH silica fibers,germanium doped silica fibers and fiber structures: silica - silica or silica -silicate or hard clad. Depending on fiber type, they can withstand wavelengths included in the ultraviolet and near infra-red (190 - 1200nm) or in the visible and infra-red (300 - 2400nm) or in a broadband range (200 - 2000nm - 400 or 2400nm). These fibers can support various numerical apertures, various types of coatings, circular / non circular shapes.